This seems to be an intrinsic aspect to many of the films by Malick, who is America’s cinematic philosopher-auteur. Malick, who majored in philosophy and translated one of Martin Heidegger’s philosophical treatises into English, has only made five films in the last thirty-eight years . But each one has a contemplative tone and mood that evokes profound questions and feelings about life and the universe. 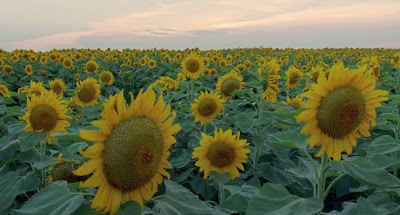 Despite their philosophical overtones, however, each of Malick’s films has been a polished, big-budget production featuring some of the finest cinematic craftsmanship that Hollywood has to offer. 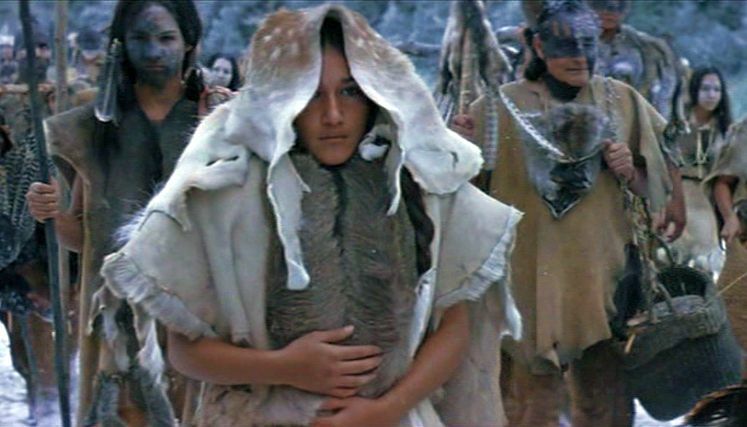 To a certain extent one might say that Malick has employed the most advanced movie-making techniques in his arsenal in order to present his philosophical perspective in a way that goes beyond verbal expression. Perhaps for this reason many of the top dramatic talents in Hollywood have been willing to drop everything in order to have the chance to appear in one of Malick’s rare film productions. The Thin Red Line was anticipated with particularly keen interest in the film community, because there had been a twenty-year hiatus between its production and that of his previous work, Days of Heaven (1978). 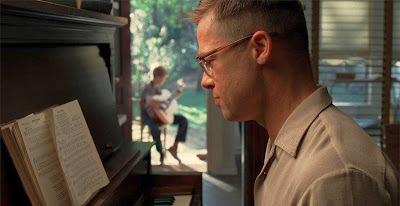 Actually Malick had been working on a film treatment of the novel since 1989, but it took some time for him to congeal his ideas and assemble the production team . Of these characters, the first six of them are centers of focalization in the story and from time to time have their thoughts presented in voice-over on the soundtrack. This is sometimes confusing, because the viewer is not always sure to which character the voice-over on the track should be attributed. The overall plot features five narrative sections or “acts”. 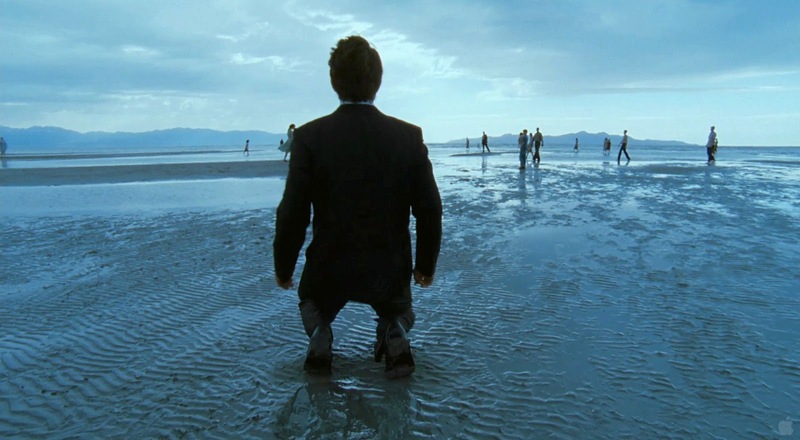 Time is not evenly distributed across these acts, though – much of the film running time takes place in Act 2, with Acts 1, 3, 4, and 5 being comparatively brief. 1. The Coming To Guadalcanal. The film begins not in a military setting, but with idyllic scenes of Melanesian natives on another island. Pvt. Witt has gone AWOL from C Company to be with these natives and escape the drudgery of military life. He is soon captured and arrested by Sgt. Welsh, who does him out of the brig but on condition that he be assigned to stretcher-bearer duty. Witt seems to be the primary focalization figure and narrative voice of the film, the one asking, “what is this war at the heart of nature”. But Witt’s perspective is enigmatic: although he initially goes AWOL, he later seeks to rejoin his company and take part in military action – why? His desire to share the life-and-death experiences of war with his comrades seems to be part of his quest to discover what lies at the violent heart of nature. Early on in this section, the viewer is presented with two opposing perspectives about life, respectively embodied by Pvt. Witt and Sgt. Welsh. Witt is moved by what he sees to be the lyric harmony of the Melanesian natives that he had observed when had run away to the island. He feels that he has seen some sort of “spark” – that there is some mystical, spiritual magic about life, and he wants to find the source of this magic. Welsh, on the other hand, is cynical and sees life as a never-ending struggle against exploitation from others. Welsh’s view is the purely selfish perspective. 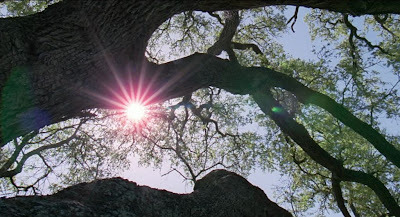 These two contrasting perspectives also underlaid the philosophical tone of Malick’s later work, The Tree of Life, and were there expressed as the “way of nature” and the “way of grace”. The “way of grace” was that of compassion, love, and surrender, and this corresponds to what Pvt. 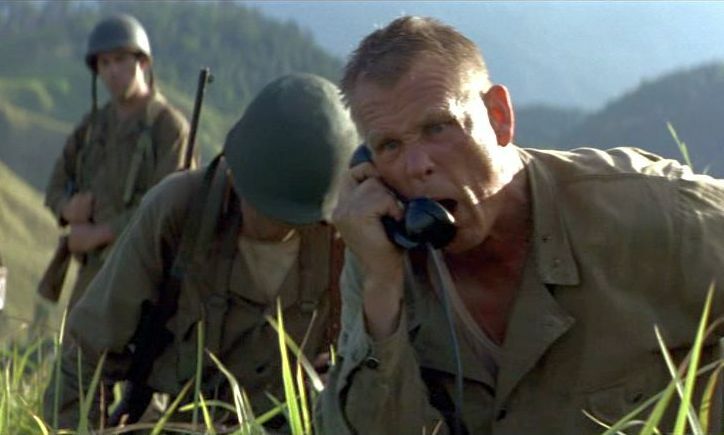 Witt seeks in the The Thin Red Line. The “way of nature” was the animalistic fight for survival here espoused by Sgt. Welsh. At the end of this section, the ship transporting the nervous soldiers of Company C’s battalion arrives at Guadalcanal, and as the soldiers charge up the beach and into the forest thickets, they are relieved not to face enemy fire. They march into the interior, where Company C will take up its assigned task. 2. The Assault on the Hilltop Bunker. The second act is the film’s longest and most dramatic segment. (For some critics this is the only redeeming part of the film, and they feel the film should have ended with the close of this act.) Company C has been ordered to take out a Japanese machine-gun bunker atop Hill 210. 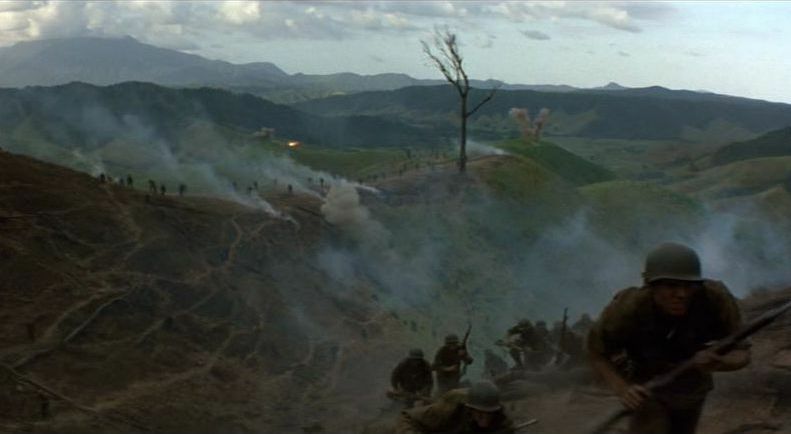 Very quickly it becomes evident that this is virtually a suicidal mission, since the Japanese can gun down any soldier making a charge up the hill. On top of this is the fact that the weary soldiers who have climbed up part of the hill to their current position are now exhausted from a lack of drinking water. They are further traumatized when they see Sgt. Keck make a simple mistake with a hand grenade and blow himself up. There is now another highly dramatic character clash between another two opposing perspectives – this time military perspectives, those of Lt. Col. Tall and Capt. Sartos. Lt. Col. Tall is an aging and frustrated career officer who feels he desperately needs to command an heroic and dangerous assault in order to gain his sought-after promotion. Heavy casualties are an expected part of this proposed scenario. Sartos is a humane and reasonable man who is unwilling to sacrifice the lives of his men in a pointless and suicidal charge. This section of the film is packed with action, featuring harrowing firefighting scenes that capture the chaotic horror of imminent death. The lasting imagery and main theme here is the intense fear and in-your-face carnage that overwhelms the participants. Some of them break down completely, others go literally mad. One of the soldiers, Pvt. Bell, only manages to maintain his sanity by continually focusing on his intense love for his wife back home. One gets the feeling that maybe that perhaps these scenes get closer to what being in a war is really like. Eventually Sartos is relieved of his command, the hilltop bunker is captured, and Company C, now headed by Capt. Gaff, is successful in taking the hill. 3. The aftermath of the battle. After the successful hilltop assault, the soldiers rampage through the Japanese camp, killing indiscriminately. Some of the soldiers take out their nerves by brutalizing the miserable, emaciated Japanese soldiers they find and treating them as if they were farm animals to be slaughtered. When the dust settles, the soldiers are given a week-long leave to celebrate their victory. Many of them quickly get drunk, and there are various exchanges between them that show how their war experiences have changed them. Capt. 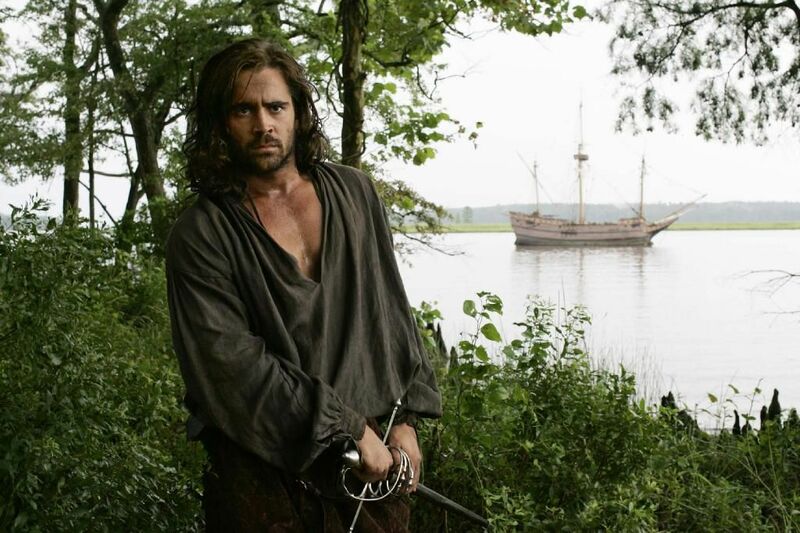 Staros bids farewell to his men and returns home. Pvt. Witt revisits the Melanesian village he had seen earlier, but instead of seeing the near-heavenly comradery of before, he sees only mean-spirited, venomous people at odds with each other. Pvt. Bell receives a curt “Dear John” letter from his beloved wife informing him that she has fallen in love with another man and wants an immediate divorce. C’est la vie. Abruptly, the scene now shifts to a short time later with Company C in action again. This time they are wading down a shallow stream and are fearful that they are sitting ducks to an impending Japanese assault. Pvt. Witt, Corporal Fife, and another soldier are sent out ahead on reconnaissance. When they run into a large Japanese contingent, Witt sends Fife back to warn the others and sacrificially stays behind to hold off and delay the Japanese. In a confusingly brief scene, Witt is eventually surrounded by the Japanese soldiers who shout something to him, perhaps demanding that he drop his weapon. But Witt suicidally raises his rifle and is immediately riddled with bullets. 5. Epilogue.The focalization now shifts back to Sgt. Welsh, as he cynically watches the newly arrived Capt. Bosch address his new troops with what Welsh takes to be the usual nonsense military rhetoric about brotherhood. Later at the beach, the landing craft arrives to remove the troops, and the natural rhythm of life returns to the island. 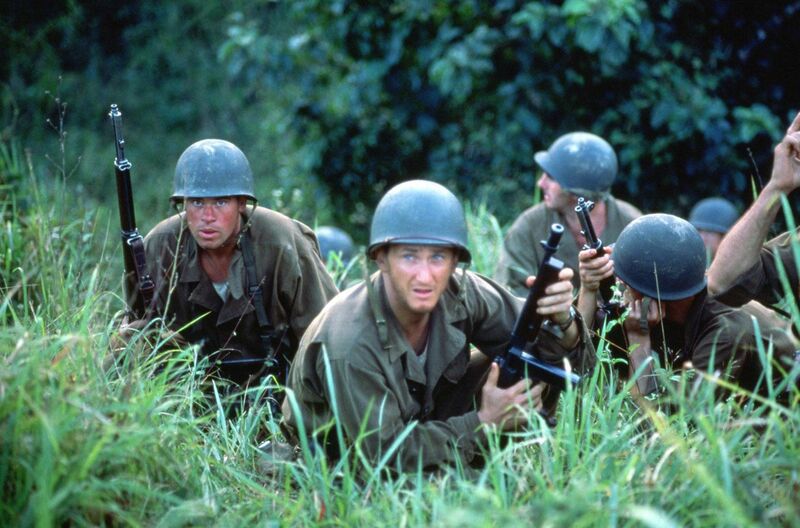 There are two intriguing aspects to The Thin Red Line that distinguish it from other films and make it simultaneously both puzzling and memorable. One of these aspects is the purely visual manner that Malick employs to create a sense of existential engulfment. Although there are numerous camera closeups, the viewer always has the feeling that the soldiers are embedded, almost entombed, in a disturbing, alien environment. The surrounding context is not suffocating; it is alive, even overwhelming. When the soldiers in Act 2 are filmed in the tall grass, their natural environment seems both to isolate and expose them at the same time: they are vulnerable to attack from the outside, and yet they have difficulty getting their bearings concerning where they should go for safety. This cinematic mood that Malick creates pervades the entire film and gives it an eery mood throughout. A second puzzling yet compelling aspect of the film is its narrative. Act 2 has the more or less conventional film narrative structure of a thrilling and bloody military mission. But that’s just one segment of The Thin Red Line – there also Acts 1, 3, 4, and 5, which turn the viewer’s interest to things beyond that particular battle. Taken together, these collected sections turn the film into an unresolved meditation about what is the driving force that animates nature. This narrative complexity is compounded by the manner in which narrative voiceover is used in the film. There are (at least) six characters featured in voiceover (Witt, Welsh, Tall, Sartos, Bell, and Fife) , and they represent conflicting moods and perspectives to the film’s multivocal interior monologue. At first it seems that Pvt. Witt represents the principal narrative voice, and so his position in the philosophical disputation with Sgt. Welsh appears to have a privileged status. But with Witt’s death late in the piece, he disappears from the scene, and the final narrative voiceover in the film comes from Welsh. Are we to conclude that Welsh’s pessimistic perspective came to dominate in the end and represents Malick’s conclusion? 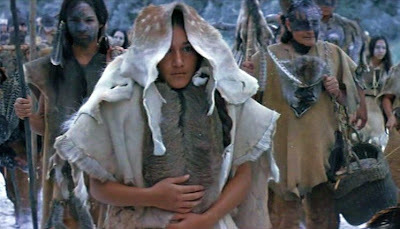 Similarly in the Sartos-Tall dispute, the more humane Sartos is removed from the story, and only Tall’s ruthlessness remains at the end. Again the voice of compassion is silenced. Moreover, one of the most interesting and poignant voiceover themes is Pvt. Bell’s romantic dedication to his soulmate, which is an otherworldly obsession about the indestructibility of love that is as casually dismissed by fate in the end as was Witt’s quest for that vital spark of life. 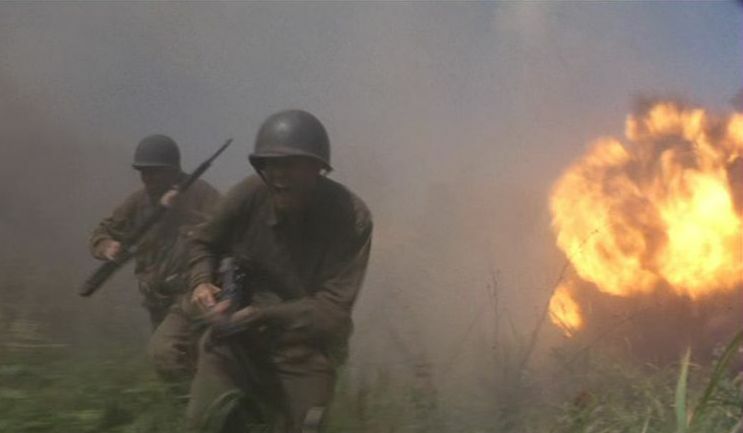 But as with all of Malick’s films, what lingers in the mind of the viewer at the end of The Thin Red Line is not the concluding tones of frustration and emptiness, which are almost always disappointing in his films, but the ineffable moods that are conjured up along the way. These are fleetingly captured in brief, distracting images – sometimes of birds and wildlife, sometimes in momentary, quizzical expressions on faces. 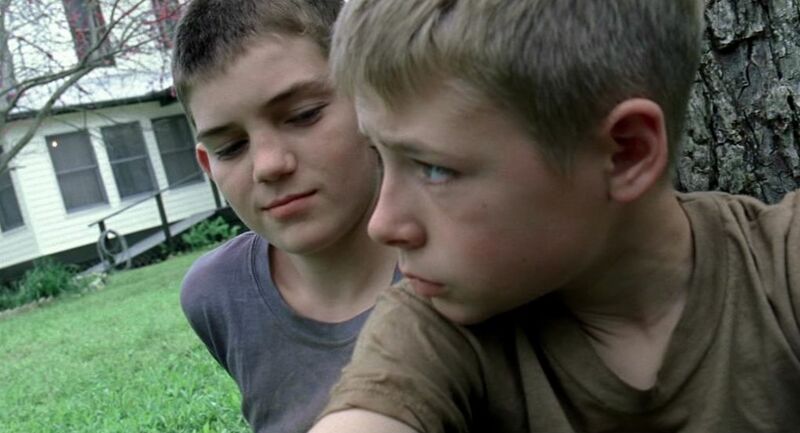 They leave us with the same questions and aspirations that drove Pvt Witt to keep on looking. 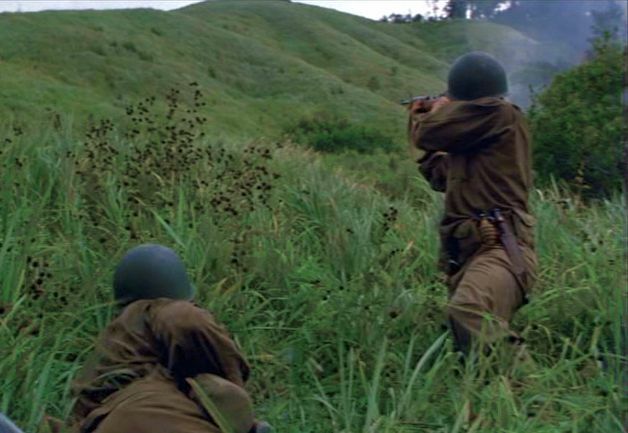 The Thin Red Line was the third of the five film’s Malick has made so far. The others are Badlands (1973), Days of Heaven (1978), The New World (2005), and The Tree of Life (2011). Josh Young, “Days of Hell”, Entertainment Weekly, January 15, 1999, (http://www.ew.com/ew/article/0,,274092,00.html – see the continuing pages of this article). Young’s article  says there are eight voiceover narrators. "Terrence Malick: the Return of Cinema's Invisible Man", by Jason Solomons, The Observer, 3 July 2011.